Looking for Summer Date Ideas in Vancouver? Vancouver offers a wealth of unique summer date ideas and venues, but a measure of wealth isn’t necessarily required to enjoy them. Whatever amount you’re prepared to spend, if you’re looking for a place to bring a date in this vibrant city, you are fortunate indeed. There are many terrific ideas for a summer date in Vancouver. For a potentially cheap date that is rich in enjoyment, you could go for a summer date at Stanley Park, Vancouver’s “crown jewel.” Whereas the famed seawall is typically well-populated, Stanley Park offers quiet forest trails and tranquil but breathtaking views. Pose for a couple selfies next to English Bay and enjoy the waterfront breeze. Take a leisurely climb to Prospect Point, where the views are even more impressive and you can enjoy burgers, ice cream, fish and chips, coffee, and/or beer. There you will also be able to watch boats in the inlet from a comfortable deck. On Tuesday nights in summer, enjoy an outdoor movie. The Evo Summer Cinema Series at Stanley Park in Vancouver is as excellent an idea as any for a date in summer. 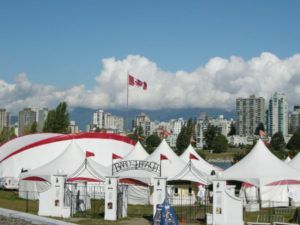 In Vancouver’s Vanier Park, Bard on the Beach is a summer activity that has been enjoyed annually since 1990. In Bard Village, there is a Mainstage Theatre tent that seats 733. In the Douglas Campbell Theatre tent, 240 seats are available for reserve. What could be more romantic than walking straight from a sandy beach into a tent to enjoy a dose of classic Shakespeare? For a uniquely Vancouver date idea, take a ride on the False Creek Ferry or an Aquabus to Granville Island. The boat ride can be one of the best parts. You get unforgettable views of the city, close looks at bridges from underneath, and a harbor cruise. The Public Market on the island is one of the favorite attractions. In addition to choosing exotic flavors for home cooking, there are crafts to tempt the discerning shopper. You can even schedule Public Market tours, where passionate experts provide plenty of food for thought. 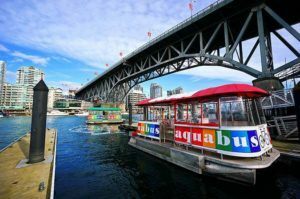 Granville Island Aqua Bus is a fun and unique summer date Idea. 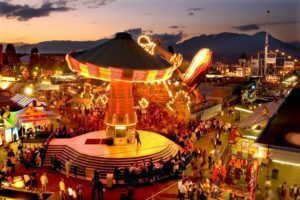 For a memorable time full of ambitious fun, a trip to the Pacific National Exhibition (PNE) is a perfect Vancouver date idea. There are activities galore to choose from. The Fair and Summer Night Concerts at the PNE run from August 20 through September 5, 2016. Many Vancouverites consider the PNE the best part of summer. Make sure to try out the infamous Wooden Coaster at Playland. PNE Vancouver is a great summer date idea. These are just a few of many phenomenal Vancouver summer date ideas. Where will you bring your date?